Rural apartment, 2 Bedrooms, Living-Kitchen, Porch, Bathroom. Located in Oviñana, Cudillero, in western Asturias, are the El Cueto tourist apartments. The ideal enclave makes Oviñana the perfect place to stop the clock to appreciate all those things that the landscape and countrymen offer us. Its situation in full rasa makes it possible to travel its geography on foot, by bicycle (that we provide) or on horseback, being able to descend to unforgettable beaches such as silence, small marisqueros ports like Puerto Chico, or discover the incredible panoramic views that can be seen from the Mirador del Faro Vidio, letting ourselves be enveloped by the beat of the waves and the warm light of the Cantabrian sunsets. The rehabilitation of a typical Asturian farmhouse has resulted in two cozy stone apartments with one bedroom, living room-kitchen, bedroom (double bed), bathroom and equipped with everything you need to make your stay an unforgettable moment. 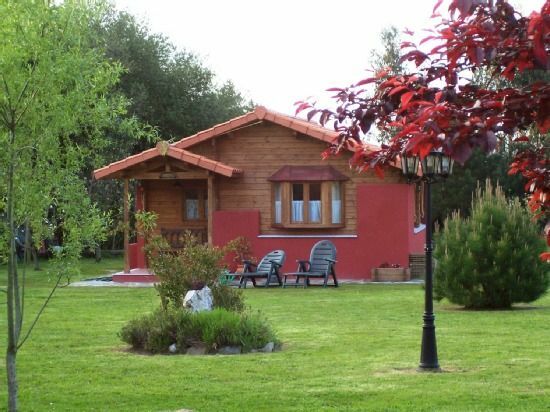 On the same property we have a wooden cabin with two bedrooms, living room, kitchen and bathroom. All have individual porch, deck chairs, garden table, barbecue, parking, playground, common laundry area, on a large estate of 7000 meters surrounded by nature. One animal is allowed per apartment except in high season. The animal can not be left alone in the apartment or garden if its owners are not with it. The village parties are in mid-August. - Outside you can enjoy a pleasant porch overlooking the prairie, surrounded by pine trees, and as a backdrop the sound of the sea, which due to its proximity becomes an exceptional protagonist for any activity in the surroundings. - The apartments also have: - Private parking - Yard - Barbecue, which allows pleasant outdoor meals.